The following was extracted from www.findagrave.com and possibly relates to lot 72 and lot 73. I took this photo back in 1969 as part of a Girl Scout clean up. Sorry the photo isn't any better, I was a kid with an old film camera! It looks like born JAN 18, 1870 and died July 7, 194?. And his wife, Mary E. June 3, 1883 to OCT 9, 1948. 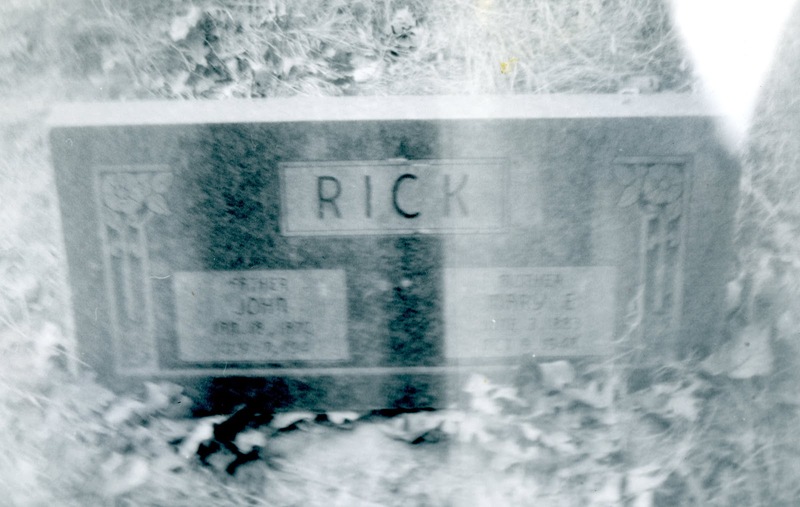 FROM IL DEATH INDEX; JOHN M. RICK BORN 18 JAN 1870 CENTERVILLE, WISCONSIN, DIED 7 JULY 1941 TINLEY PARK, ILLINOIS, BURIED AT BACHELORS GROVE CEMETERY. FATHER MICHAEL RICK BORN IN GERMANY, MOTHER CHRISTINA KEPTEL ALSO GERMANY. WIFE MARY, RESIDENCE TINLEY PARK, BREMEN, COOK, ILLINOIS.